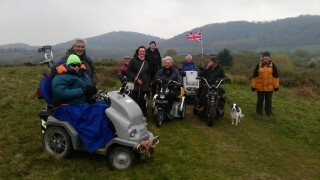 The Disabled Ramblers were joined by BBC Breakfast this Easter weekend for a walk in Ledbury, Herefordshire. The Disabled Ramblers champion improved access for all and encourage those with mobility issues to explore the countryside. Craig Wareham, ViewRanger co-founder, accompanied the Disabled Ramblers on their walk and says enjoying everything the British countryside has to offer should not just be the preserve of the able-bodied. “We added a new ‘walking with wheels’ category to the ViewRanger app earlier this year and this is proving popular. I think the Paralympics have shown that having wheels shouldn’t deter you from having adventures. Craig says similar issues apply for people with pushchairs, limited mobility or simply for those whose legs aren’t as young as they used to be. To see Craig's TripStory of the Easter walk with the Disabled Ramblers click here. To see the Disabled Ramblers’ routes on my.ViewRanger.com click here.